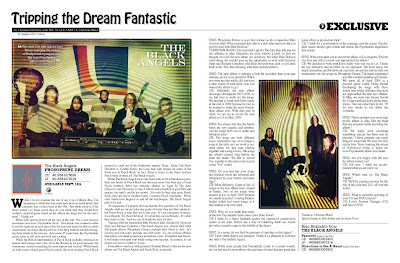 Discussions Magazine Music Blog: An EXCLUSIVE interview with THE BLACK ANGELS! New album available September 14th! An EXCLUSIVE interview with THE BLACK ANGELS! New album available September 14th! While I do not condone the use of any type of illegal drug, I’m beginning to think that they must have been so much better (and certainly way cooler) back in the ‘60s. Just think about it: if the drugs weren’t so damn good, then do you think that they would have created a musical genre based on the effects the drugs had on the user’s mind? I think not. When LSD and Acid were all the rage in the mid ‘60s, a new musical movement was born: Psychedelic Rock. This music was created in order to aurally replicate an acid trip so that the non-user might be able to safely ‘understand’ the mind-altering effects of the drug without actually damaging their minds in the process. And some 45 years later, the Psychedelic music scene is still alive and well and rocking. While the British interpretation of Psych Rock included references to lemons and oranges and a few ‘tra la las’ thrown in for good measure, the Americans created something far more surreal and visceral. While bands on both coasts created great Psych sounds, the most exciting Psych Rock seemed to come out of the Southwest, namely Texas. From 13th Floor Elevators to Golden Dawn, the Lone Star state burped up some of the finest acts in Psych Rock. In fact, Texas is home to the finest modern Psych band of them all: The Black Angels . While The Black Angels have only been with us for a half-dozen years, their raw brand of Psych Rock has attracted more fans than any of their Psych brethren. After two fantastic albums on Light In The Attic (Passover and Directions To See A Ghost ) and a handful of great EPs and singles, the band’s profile has grown. Not only do they play great Psych Rock, they are one of modern music’s greatest Psych exponents. While other bands have hopped on and off the bandwagon, The Black Angels play it for real. As musicians, it’s plainly obvious that the five members of The Black Angels could go out and play any genre of music they put their talents to, but Psych Rock is who they are to the core. It’s not just genre of music: it’s a lifestyle. It’s their lifeblood. It’s what they eat and breathe. It’s what they need to play. And we can all thank the stars for that. Signing with the relaunched Blue Horizon label (headed by Seymour Stein and Richard Gottehrer), The Black Angels now present their third full length album, Phosphene Dream , perhaps their finest to date. It’s dreamy and a bit scary, melodic and a bit noisy. It’s one of those albums that makes you stand up and race around the room. It breathes and bleeds. It will make your heart stop while curing your hiccups. In essence, it’s an album you need to listen to. Loud. I was able to catch up with guitarist Christian Bland to discuss the new album and The Black Angels and Psych Rock in general. SPAZ: Phosphene Dream is your first release on the re-launched Blue Horizon label. What prompted this shift to a new label and how did you get involved with Blue Horizon? CHRISTIAN BLAND: Our deal with Light In The Attic Records was for two albums, so after Directions we were without a label. At first we thought we'd put the new album out ourselves, but when Blue Horizon came along, we couldn't pass up the opportunity to work with Seymour Stein and Richard Gottehrer, plus Blue Horizon was such a cool label back in the ‘60s, that releasing with them seemed perfect. SPAZ: The new album is perhaps a little bit smoother than your past releases, yet far more powerful. When you went into the studio, did you have a clear vision of what direction you wanted the album to go? CB: Definitely, the new album developed throughout 2007-2009, so we had time to work out the songs. We decided to work with Dave Sardy at the end of 2008 because he told us he wanted to make the most Psychedelic album ever. With that goal in mind, we set out to record the new album in LA in May, 2009. SPAZ: I've always felt that the band's tunes are very organic and cerebral. Are the songs born out of studio and rehearsal jams? CB: The songs are born different ways. Sometimes one of us brings a song to the table and we work it out, other times we just start playing together and a song is born. The songs are always created long before we enter the studio. We like to record live, together in the same room to give it that “live” sound. SPAZ: Do you feel that your songs and musical vision are informed and influenced by your Austin surroundings? CB: Most definitely. Eight of the 10 songs on the new album were created in Austin. Two of the songs were created in LA in April 2009 because of a newly acquired 12-string Rickenbacker which had some songs in it that needed to be exorcised. SPAZ: Why do you think that many of the best Psychedelic bands have come from Texas? CB: I think it's a direct backlash against the oppressive conservative nature of the state. Nature has a way of balancing itself out. Austin provides a creative oasis in the middle of the desert. SPAZ: In a sense, do you feel the pressure of carrying on this legacy? CB: I don't think there's any pressure. I think it's a pleasure to continue our state’s Psychedelic legacy. SPAZ: While some people link Psychedelic music to a certain 'sound', do you feel that it's more about vibe and state of mind than any particular guitar effect or production trick? CB: I think it's a combination of the message, and the sound. Psychedelic music should open minds and mimic the Psychedelic experience thru sound. SPAZ: What prompted you to record the album in Los Angeles? Did the city have any effect on how you approached the album? CB: We decided to work with Dave Sardy who was out in LA. I think the city definitely had an effect on our approach. The thick smog, the beach and palms, and Hollywood crept into our psyche and out thru our instruments into the songs on Phosphene Dream. The entire experience was like a weird kaleidoscopic dream. We spent all of April 2009 at a practice space called Swing House developing the songs with Dave which was totally different than how we approached the first two albums. In May, we went into Sunset Sound for 10 days and laid down all the basic tracks. Then we came back in Oct. '09 for two weeks to lay down the overdubs. SPAZ: This is perhaps your most high profile album to date. Did the band feel any pressure while recording the album? CB: We knew were recording something special, but there was no pressure. I think pressure can cause things to sound bad. We were five free spirits from Texas roaming the streets of Hollywood trying to make the most Psychedelic album ever heard. SPAZ: Are you happy with the way the album turned out? CB: For sure. I think we accomplished what we set out to do. SPAZ: What's next for The Black Angels? CB: We'll be touring non-stop for the rest of this year into 2011 all over the world. CB: Love’s Forever Changes (CD) and Jaws (DVD).